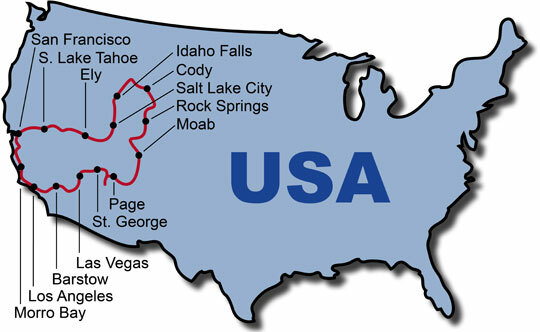 Get to know the Best Of West on your KeaRider motorcycle tour in the west of the USA. Cruising down the most beautiful highways in 14 days and discovering the splendid nature wonders of California and its neighboring states. This includes the beautiful tour on the Highway 1 along the Pacific Coast to San Francisco, as well as a visit to Yellowstone National Park and Idaho Falls. In Cody you will find information concerning Buffalo Bill Cody and life in the old Wild West. Find Wild West romantic on a ride through the Monument Valley with its fascinating rock formations and a visit to a Navajo reservation. With a visit to Las Vegas your road trip of the west of the United States ends. After an individual journey, tour participants meet in Los Angeles and drive through Malibu and Santa Barbara to the town of Solvang, where you will feel as if you are in Denmark, rather than in California. Accommodation is in Morro Bay. You will then cruise on the Highway 1 with your Harley along the beautiful coastal route in Big Sur to San Francisco where you will spend the night. Ride over the Golden Gate Bridge to Sacramento and visit the old gold mining town Placerville. You will continue on through the Eldorado National Forest to beautiful Lake Tahoe. Today the Toiyabe National Forest awaits you as well as the pretty town Genoa. It is known to be the oldest permanent settlement in Nevada. Along the Highway 50 you will reach Ely, today's destination. You will cruise through the scenic exciting Salt Lake Desert to Salt Lake City, Utah, the capital of the American Mormon sect. Today is dominated by the impressive waterfalls in Idaho Falls, where you will also stay the night. Another American nature highlight awaits you today: the Yellowstone National Park, where you will spend the whole day before you continue on in the evening to Cody. In the morning you can visit the Buffalo Bill Museum, that Cody dedicated to their famous son before you gradually drive south through Wyoming. Accommodation is in Rock Springs. You will enjoy more Wild West romantic today when we travel from Dutch John to Uinta Mountains to Moab, where you will spend the night. Today, visit the famous Monument Valley and then spend the night at the Navajo reservation in Page. Three impressive national parks you await you today: the Grand Canyon, Bryce Canyon and Zion National Park. Accommodation is in Saint George. Today's trip takes you to the gambling capital Las Vegas, where you have the opportunity to dine in the Hard Rock Cafe before you try your luck at the casinos. Today will take you to Barstow and the Ghost Town of Calico with its old silver mine. Accommodation is in Barstow. The last day leads you back to Los Angeles, where you start your individual journey back home.